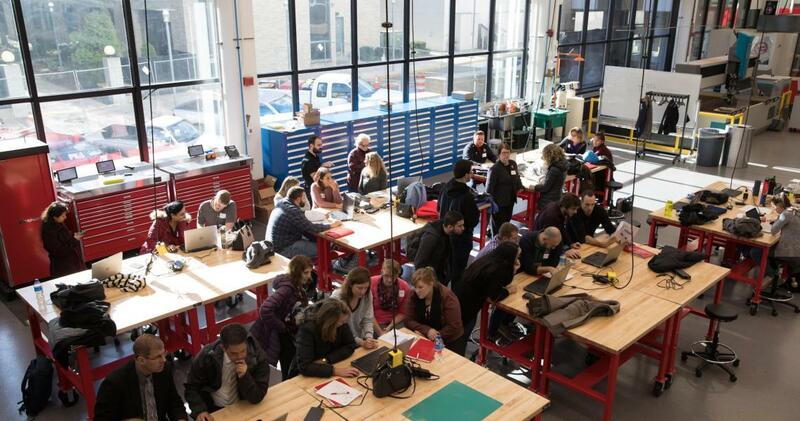 New Jersey educators attend a hands-on workshop at NJIT's Makerspace. When Parsippany High School’s Kathy Effner heard about NJIT’s Center for Pre-College Programs’ (CPCP) Try Engineering! workshop for educators, she was intrigued — particularly since it featured a hands-on project at the university’s new 10,000-square-foot Makerspace. This past October she attended that event and, along with middle and high school instructors from throughout New Jersey, learned practical applications of engineering concepts before visiting the high-tech facility. There, huddled in small groups, they all had the opportunity to use 3D printers to create keychains from a design template. “I enjoyed seeing all of those machines in one room, the organization in place to keep track of the tools, multiple 3D printers using different filaments, the stone cutter, the wood engraver and mostly the opportunity to work with CAD [computer-aided design], since an introduction to CAD is part of the curriculum for our new robotics course,” said Effner, the lead math instructor at her school whose classes this year include AP-level computer science and computer science principles, as well as an introduction to computer programming with Python and robotics. The CPCP workshop, an Institute of Electrical and Electronics Engineers Teacher In-Service Program, conducted in cooperation with NJIT’s Newark College of Engineering, was the most recent of several STEM-related professional development offerings for teachers, curriculum leaders and school principals. With interest high and many repeat customers, CPCP will continue these events in the next academic year after capping off the current series with “How to Study Physics,” scheduled for Feb. 7 on campus. The workshop will be presented in conjunction with the university’s College of Science and Liberal Arts, and provide attendees with simple, inexpensive techniques to strengthen their students’ grasp of physics. More than 420 K-12 educators have been served by CPCP’s professional development workshops, held since July 2017. The goal is to not only advance the STEM knowledge of these educators, but also send them back to their classrooms with practical information and materials they can apply to deepen their students’ understanding of the science, technology, engineering and math disciplines. Over 90 percent of respondents to a June 2018 Google survey, sent to all TryEngineering! workshop participants, indicated that they had indeed used “one or more concepts presented at the workshop” with their students. “I think it is important for teachers to get trained and to see the big world and bring that back into the classroom,” remarked Effner, who has been teaching for 14 years. “I liked the lesson about balance [at the workshop], so I ran it with my robotics class. The students liked it, but it took a long time to run the class, because they were being introduced to that level of delicate balance." CPCP will shortly unveil another series of STEM workshops, designed specifically for 8- to 12-year-olds and their families. NJIT professors and staff will lead the on-campus series on three consecutive Saturdays — Jan. 26, Feb. 2 and Feb. 9 — from 8:30 a.m. to noon. • Cracking the Code - Information systems professor Keith Williams will guide students and families through the practice of coding. • Biomedical Engineering - Bryan Pfister, professor of biomedical engineering, will lead attendees through the creation of assistive medical devices. A tour of NJIT’s state-of-the-art Makerspace will follow the workshop to demonstrate how 21st-century innovation happens in real time. • TryEngineering! - Moshe Kam, dean of the Newark College of Engineering, will take attendees through the engineering design process as they become engineers for the day. This workshop will include a tour of Makerspace as well.